Designed for meetings, lectures, interviews and personal notes. Record notes on the move in high quality. Built-in microphones reduce background noise, make crystal clear recordings, picking up voices up to 15 feet away. 3. Timed recording. When set up, the recorder will turn on, record, save the recording automatically at a specific time. MP3 is the most common file format, can be played virtually anywhere like on MAC and iPad, simply share them with others. The WAV format retains all samples of an audio track, allowing stereo recording in CD-like audio quality. Store up to 576 hours of recording or 1500 songs. It stores 135 hours of recording recorded at 128kpbs in MP3 and 250 hours of recording at 64kpbs. It's displayed as a removable drive once connected to your computer via USB, no need to install additional software. Convenient to store, back up and share files. 1. Click the Play button to start/stop playback. 2. Hold down the backward or forward button to rewind or fast forward during playback. 3. Download musical files to the internal memory, making it work as a MP3 player. Can be easily charged through a micro USB jack, record up to 15 hours on one charge, ensuring your recorder will always be ready to work when you are. Weight 1.9oz, size 4'' x 1.5'' x 0.4'', the recorder is made to be portable. The extra hole for lanyard makes it more convenient for hands-free recording. 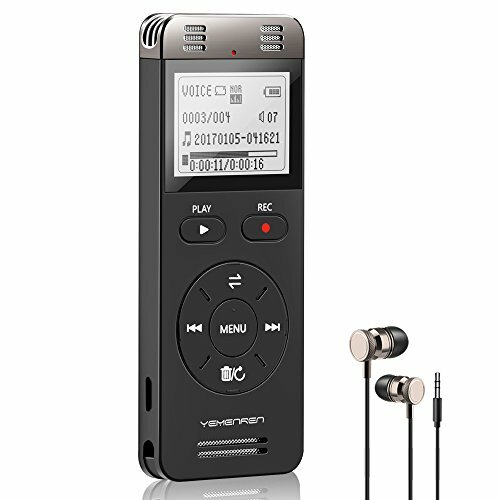 SUPERIOR RECORDING QUALITY - Clear recording with 1536kbps voice resolution, and two ultra-sensitive microphones with dynamic noise reduction means you can enjoy crystal clear recordings. POWERFUL FEATURES - 8GB internal memory let you store up to 576 hours of recordings (record at 32kbps) or 1500 songs.16 playback speed, fast forward and rewind during playback. Quality ABS plastic case, light and ultra-portable. EXTRA LONG BATTERY LIFE - The rechargeable Li-polymer battery guarantees 10+ hours (about 15-18 hours) of recording on one charge, ensuring your recorder will always be ready to work when you are. A must have when phone is not allowed or may run out of battery. ONE YEAR MANUFACTURER'S WARRANTY. If you have any questions about this product by YEMENREN, contact us by completing and submitting the form below. If you are looking for a specif part number, please include it with your message.